Amber Japanese Glass Ball Fishing Float With White Netting Decoration 2"
Orange Japanese Glass Ball Fishing Float With White Netting Decoration 2"
Red Japanese Glass Ball Fishing Float With White Netting Decoration 2"
Green Japanese Glass Ball Fishing Float With White Netting Decoration 2"
Light Blue Japanese Glass Ball Fishing Float With White Netting Decoration 2"
Blue Japanese Glass Ball Fishing Float With White Netting Decoration 2"
Clear Japanese Glass Ball Fishing Float With White Netting Decoration 2"
Red Japanese Glass Ball Fishing Float With Brown Netting Decoration 2"
Blue Japanese Glass Ball Fishing Float With Brown Netting Decoration 2"
Red Japanese Glass Ball With Brown Netting Christmas Ornament 2"
Light Blue Japanese Glass Ball With White Netting Christmas Ornament 2"
Green Japanese Glass Ball With White Netting Christmas Ornament 2"
Orange Japanese Glass Ball With White Netting Christmas Ornament 2"
Red Japanese Glass Ball With White Netting Christmas Ornament 2"
Amber Japanese Glass Ball With White Netting Christmas Ornament 2"
Blue Japanese Glass Ball With White Netting Christmas Ornament 2"
Clear Japanese Glass Ball With White Netting Christmas Ornament 2"
This Amber Japanese Glass Ball Fishing Float With White Netting Decoration 2" is a perfect piece of beach wall art. 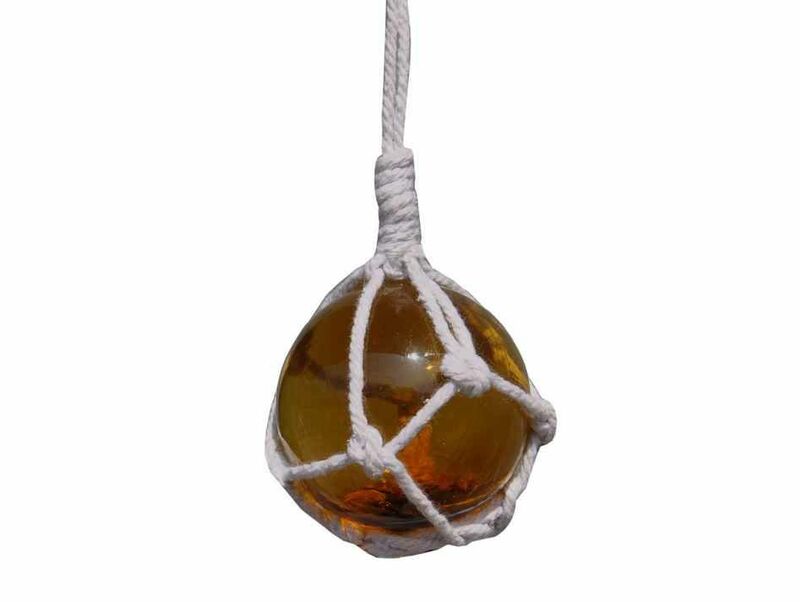 Gorgeous whether in your home or office, enjoy the charming inner warmth of this buoy float as lights play through the amber glass ball. Perfectly contrasting the glass float is the authentic fishing rope netting which holds the float in place. Mesmerizing and enchanting, enjoy the historic wonder and brilliant style of this nautical glass float each and every day.